This is a lot of information about weather in Costa Rica. To skip the meteorological details go to “The Best Time to Visit” or “Make Your Own Accurate Forecast” or use the menu to read one of the other more generic posts in the weather category. 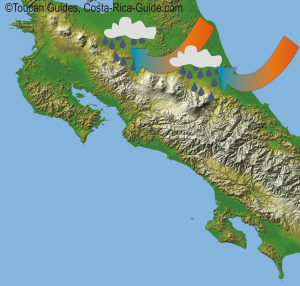 If you really want to know about weather in Costa Rica, how, why and when it happens then read on! 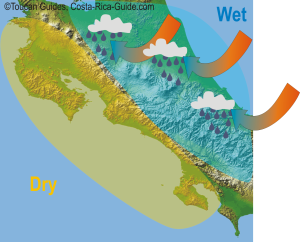 Why Does it Rain in Costa Rica? While the micro-climates are incredibly complex and difficult to predict in a general manner overall rainfall in Costa Rica follows a predictable pattern and it’s fairly well understood. 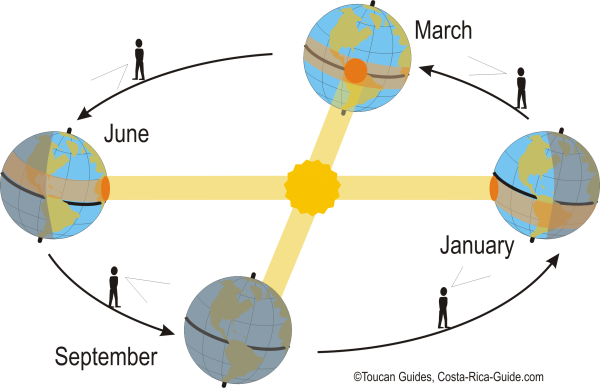 From May through September the tilt of the earth creates long, warm summer days in North America and brings the sun directly overhead in Costa Rica. Where the sun shines straight down it heats more, warm air picks up moisture near the surface, then rises and expands. Expansion cools the air forcing the water out, first as tiny droplets that form clouds, then as the droplets combine into drops, rainfall. From May through August the area of greatest heating and convective rainfall is north of the equator, over Costa Rica creating the rainy season. 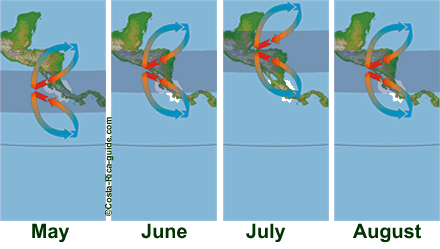 The rainy season in Costa Rica corresponds with this period of increased heating during the northern hemisphere summer (Ticos call these months winter). By November the earth has realigned and the sun shines directly overhead somewhere south of the equator, moving the band of intense rainfall with it. This marks the beginning of Costa Rica’s dry season. The picture below shows two reasons the sun feels hotter when it’s directly overhead at the equator. First, the light that hits near the poles (top pair of arrows) travels through more atmosphere before reaching the surface than light near the equator (bottom pair of arrows). 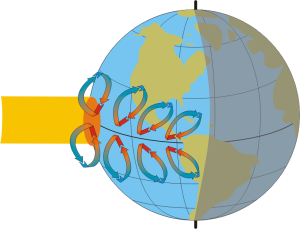 Second, because of the angle relative to the path of the rays, the sunlight near the poles is spread over a larger area (orange box) than at the equator. Uneven Heating of the Earth Surface. In this drawing the sun is pointed directly at the equator, representing the vernal or autumnal equinox. Since the intensity is greatest on the region where the sun is directly overhead, that region is heated more, creating a band of higher temperatures and warmer earth and ocean surfaces. 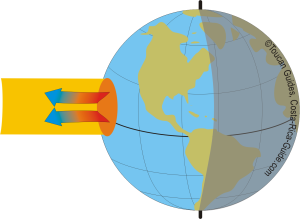 The uneven heating of the earth creates areas of warm air that tends to rise. When the warm air rises it leaves behind a gap that’s filled by air from surrounding regions moving in. We call moving air wind. Air from surrounding regions moves in to replace the warm air as it moves up. 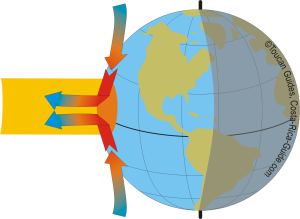 The air that moves in to take the place of the rising air has to come from the north or the south because the air to east and west is also extra hot and rising. As the warm air rises it expands and cools. Since cool air cannot hold as much moisture this often results in rainfall. 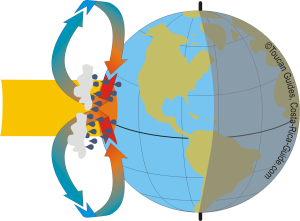 The cooled air is then drawn back towards the poles, sinking towards the earth to replace the air moving along the surface towards the equator. This cycle of air movement is called convention and causes convective rainfall. The air moving across the surface towards the extra heated region is known as the trade winds. The region where the northern convective airflow meets the southern and the air starts heading up instead of across the surface is known as the doldrums by sailors. The upwelling warm moist air expands, cools and drops heavy rain, but since it’s moving up instead of across it won’t fill sails. 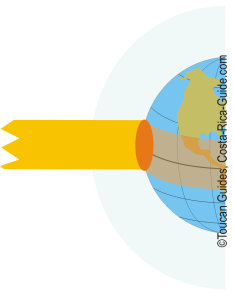 Another name for the doldrums is the Inter-tropical Convergence Zone or ITCZ, and as you’ll see on the following pages the migration of the ITCZ as the earth travels around the sun on its yearly journey is what causes Costa Rica’s rainy and dry seasons. At first glance you might expect the trades to be consistent winds straight down from the north, and up from the south. However, there is one more important element to introduce and that is the spin of the earth. 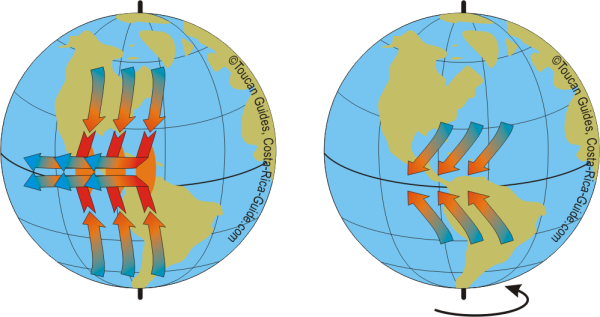 Since the earth rotates on its axis the winds are deflected as shown in the second panel by what is called the Coriolis effect. So, the trade winds blow from the northeast in regions north of the ITCZ and from the southeast in regions to the south of the ITCZ. 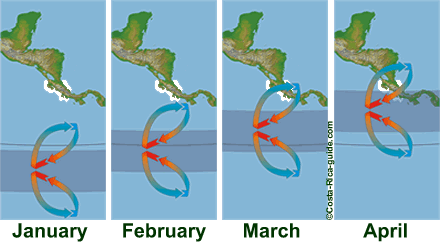 The deflection of the trade winds plays an important role in the orographic forcing that creates the lush superwet rainforests on the Caribbean side of Costa Rica and the rare tropical dry forests (and sunny Nicoya beaches) on the Pacific. If you could follow the earth around from space like the little symbol person in the picture above it would look like the earth was tipping back and forth. 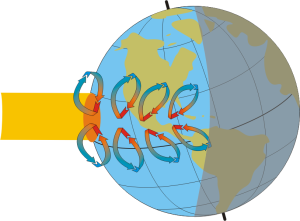 In the different seasons you could easily see the migration of the location of the the direct overhead sun as shown in the drawings below. 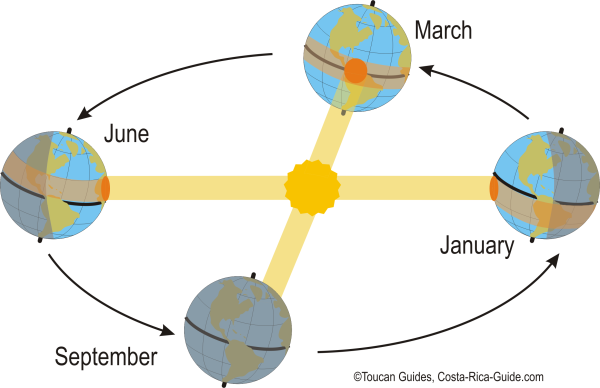 In the Fall and Spring the sun is directly over the equator. By the end of December the direct sunlight has migrated south of the equator. 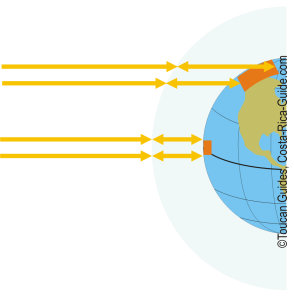 By the end of July the position is inverted and the sun is directly over regions north of the equator. The ITCZ follows the overhead sun across the surface of the earth, and the heavy convective rains follow the ITCZ as indicated by the blue band on the maps below. In January the ITCZ is at its farthest south and Costa Rica is at its driest. Over the next four months the rainfall moves north. By May the zone has reached Costa Rica marking the start of the rainy season. 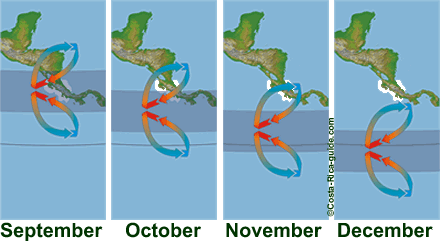 By November or sometimes December the ITCZ has moved south of Costa Rica and the dry weather returns. Everything we’ve looked at so far indicates that the positions of the ITCZ should be symmetrical around the equator, but that’s not exactly the case. Observant readers may have noticed that the ITCZ in the region around Costa Rica travels farther north than it does south. 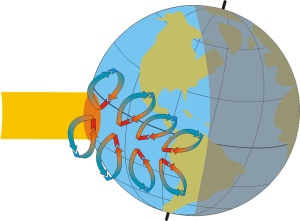 The actual location of the ITCZ is affected by many things other than the latitude where the sun is directly overhead. The actual location of the ITCZ is affected by many things other than the latitude where the sun is directly overhead. Most notably by landmasses and ocean currents. The drawing below shows the actual average position of the ITCZ in July and January. You can see how the bulk of South America affects the position of the ITCZ pulling it southward on the eastern side and pushing it northward on the western side. This northward deflection of the ITCZ near Costa Rica has two major effects. The first is a shift in exactly which months are the rainiest so that September and October are included. If there were no deflection the ITCZ would be south of Costa Rica by that time of year. 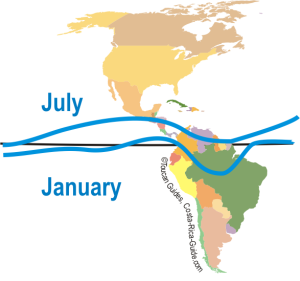 The second is that the ITCZ often actually moves past Costa Rica to the north in July and August causing a few weeks of dry weather in the middle of the rainy season that are referred to as Veranillo de San Juan (the little summer of St. Joe). The big picture presented so far shows that May through October are the rainiest months of the year. In addition to the long seasonal patterns, it explains the typical rainfall pattern on a much shorter daily timescale. It’s well known that clouds build over Costa Rica during the day (during the heating phase) and rain usually falls in the afternoon and evenings (after the warm air has had time to rise and cool). From April to October tradewinds are blowing across the Caribbean picking up moisture from the warm sea surface. If the warm moist air could continue unimpeded it would eventually rise as part of the ITCZ circulation pattern, but the mountains of Costa Rica get in the way. 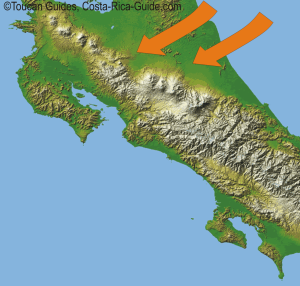 Costa Rica’s backbone of peaks force the air upwards causing the familiar rising, expanding, cooling clouds and rainfall. The consistent direction of the wind from the northeast creates a region of heavier rainfall on the Caribbean slopes and over the central mountains. The air continues to move to the southwest, but by the time it reaches Guanacaste, Nicoya and the Pacific much of the moisture has been removed. The tropical dry forests of Guanacaste and the Nicoya peninsula developed because Costa Rica’s central backbone of mountains lifts the warm air that has picked up moisture as it flows consistently towards southwest across the Caribbean. As the warm moist air is driven up it expands, cools and drops its moisture. The air continues to the southwest, but by the time the trades reach the Pacific shores the air is drier and the rains lighter when they do occur. The trade winds are so named because sailors could rely on their consistency and established trade routes based on it. The predictability of the direction and migration of the trade winds and ITCZ also means that travelers can know what to expect during their vacation. In general Costa Rica’s dry season extends from sometime in mid November or early December until late April or May, and not surprisingly the tourist high season and accompanying doubled crowds and prices coincide. There are advantages and disadvantages to travel either at peak or off peak times, but if you know about Costa Rica’s secret mini dry seasons you can have the best of both worlds. From September through mid November the southern band of trade winds lie over Costa Rica and orographic forcing by the central mountains creates heavy rainfall over the Osa Peninsula and the southern Pacific but a dry pattern over the Caribbean coast. One, the Veranillo San Juan was already mentioned. The west experiences a little dry season in the middle of the wet in late July and August as the ITCZ rain band moves north of Costa Rica. The second even lesser known mini dry season is along the southern Caribbean in September through mid November. While the Pacific coast is still in the midst of the rainy season, indeed the southern Pacific gets most of its rain in these three months; Cahuita, Puerto Viejo, Uva and Manzanillo are reveling in sun and surf during some of their driest months.